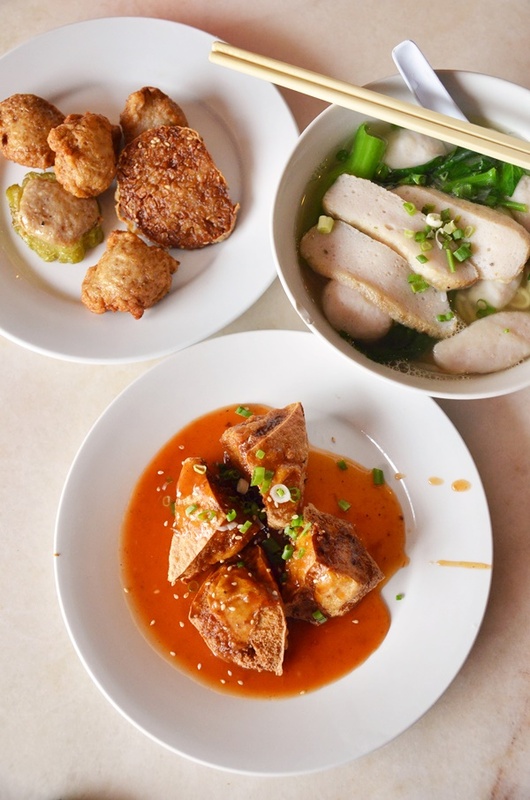 Outside of Ipoh, sar kok liew may not ring a bell with most yong tau foo lovers who are more familiar with the usual repertoire of fish balls, stuffed beancurd, stuffed chillies and deep fried beancurd sheets or foo pei. However, any self-appreciating food lover from Ipoh would highly regard sar kok liew as one of the most delicious, yet basic item that every single fish ball noodle stall should have. Basically the yambean is diced or cut into smaller chunks, and mixed with fish paste to create the filling. 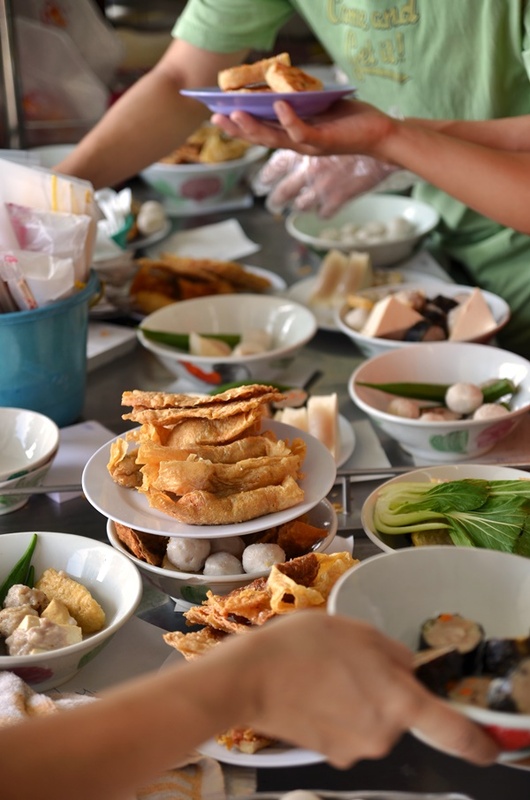 A portion of the filling will be placed on a piece of beancurd sheet or foo pei and the sheet will be rolled to form into a thick cigar-like roll. The ends will be sealed with a paste of flour and water prior to deep frying. 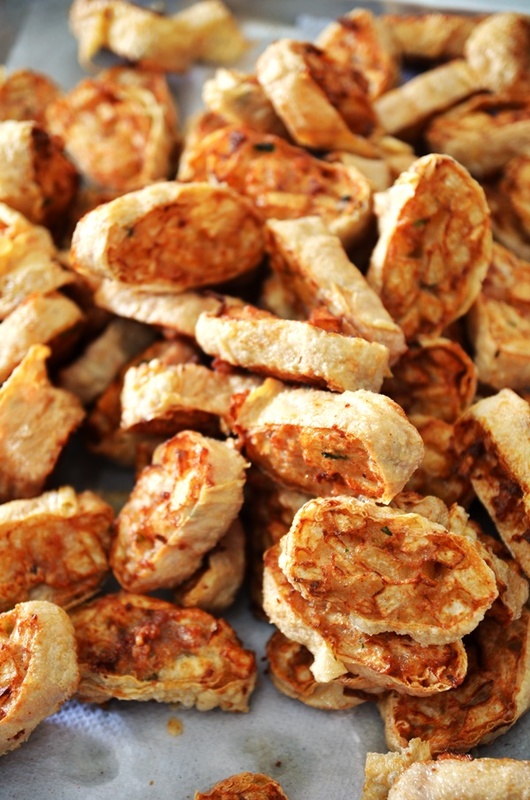 The result is a soft, warm and gooey centre of juicy yambean cubes with a light crunch, encased in a thin, crispy layer of beancurd sheet fried to a golden brown hue. It is served with garlic chilli sauce in the typical fashion of fish ball noodle stalls, or sometimes homemade sauces (and these stalls get brownie points too for daring to be different) with a vinegar-ish tang, or sometimes with a slightly sweet taste to balance off the heat from the chillies and savoury burst of flavours from the yambean and fish paste. Besides Big Tree Foot, there are many other places in Ipoh that you can find excellent sar kok liew. Within a short distance away is an air-conditioned shop named Nam Fatt along Kampar Road (now renamed to Jalan Raja Permaisuri Bainun). Nam Fatt not only excels at sar kok liew but a host of other yong liew including some with interesting twists, like the stuffed beancurd with fish paste served with a generous ladle of their West gravy, which is a tangy tomato-based gravy and sprinkled with a handful of sesame seeds, as well as a hearty bowl of mixed beef soup with melt-in-mouth white radish. The dining environment is definitely more comfortable, and ordering is a la carte from your table with an ordering chit and a full-fledged menu with pictures. Right smack in the center of Ipoh is the Sri Mahkota Buntong beef noodles shop at the corner of Theatre Street in Ipoh, facing the now undergoing redevelopment Octagon Market (Pasar Bulat) Their specialty is no doubt their beef noodles and plain noodles garnished with chopped scallions and tossed in a savoury and sweet thick dark soy sauce spiked with crispy lard fritters. But their selection of own-made yong liew deserves a thumbs-up too and their sar kok liew is above average compared to most noodle stalls in town. 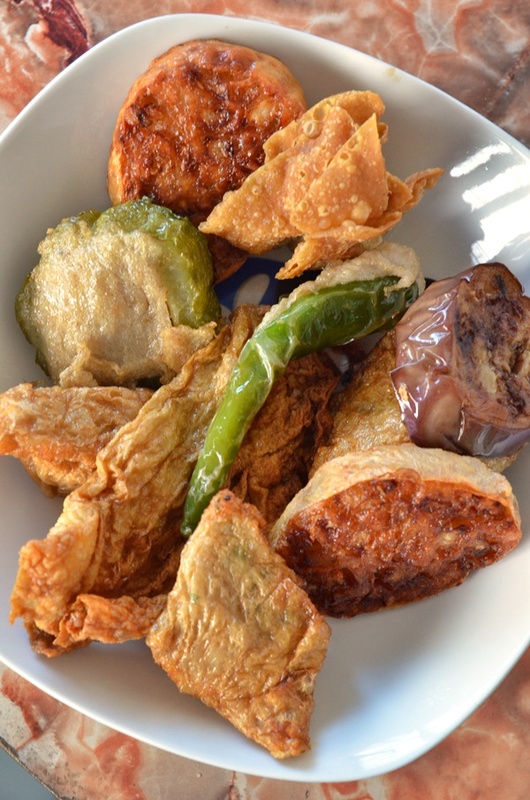 A plateful of sinful yet irresistible fried yong liew from Big Tree Foot in Pasir Pinji; easily one of the most popular hawker stalls in Ipoh. Going slightly off the beaten track is an almost nondescript humble stall known as Ngan Woh coffee shop along the main road of Jalan Bercham leading towards the inner residential areas. The shop specialises in steamed fish head with bittergourd really, but their freshly fried sar kok liew is different visually due to the oblong shape and is as good as any fish ball noodle stalls can make them. And last but not least, if you venture towards Menglembu/Falim area, you will find Kedai Makanan dan Minuman Desa Rishah awkwardly wedged between clinics, stationery shops and all. This is another famous Buntong beef noodles shop but the freshly prepared sar kok liew (you can already smell from a distance away) in front of the premises is very inviting. And the proximity of this shop to the labyrinths of Ipoh bean sprouts growers in Buntong (not easy to locate them, since these are grown from the compounds of houses) means that the supply that goes with the noodles is as fresh as they can get; crunchy, stout and juicy taugeh. 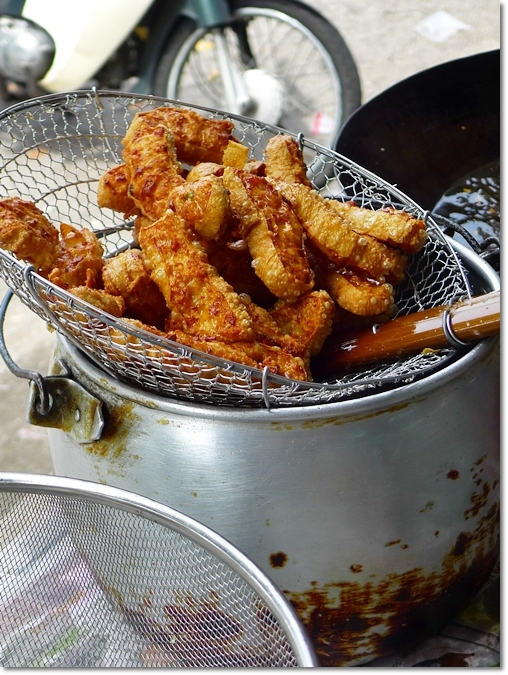 So the next time you visit a noodle stall in Ipoh where you are allowed the flexibility to choose your own pieces of yong liew, make sure you keep your eyes peeled for the golden brown chunks of delectable sar kok liew — an Ipoh-only specialty that could just be your most favourite piece ever. When I was studying in SMJK Yuk Choy in late 1970s , the canteen used to sell sar kok liew. I remember having it for breakfast early in the morning. there is a stall at Big Box food court in Jurong East simply called Ipoh Hor Fun. They have sar kok liew & I had my fix there more than once. I think there is a deluge of Malaysian hawkers setting up store here in Spore. At Jurong Point there are many hawker stalls from Penang & Ipoh at a joint called Malaysia Boleh. One of them is Buntong Ngar Choi Kai which is quite good. is it halal?llike the fucuk.